Photo bombed by Lord Boo, cat supremo, feline mastermind of the neighbourhood. Hey there. It’s been a while. I’ve been-a-sewing but sometimes it’s nice to swim below the surface for a while. You know how life goes. So here we find the all new ‘I love Liesl’ page. 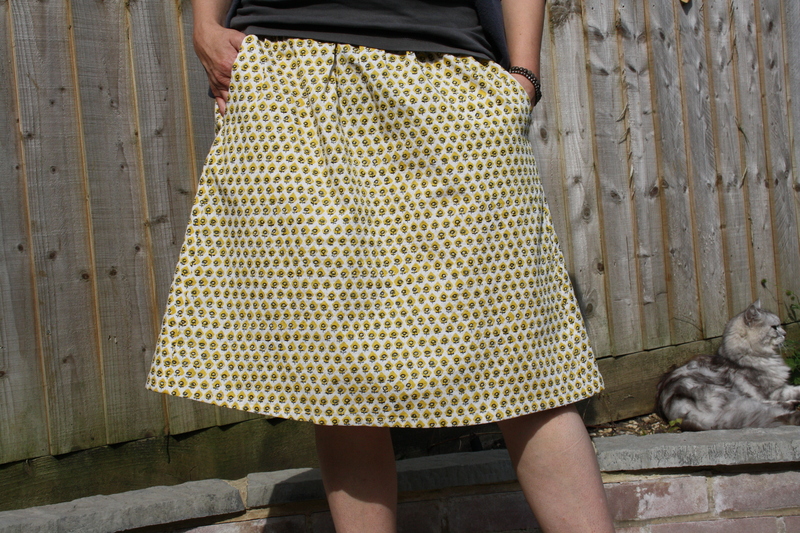 The Everyday Skirt is a pattern by Liesl & Co that I first saw all sewn up on What Katie Sews – following her links there were some other rather splendid versions out there too – and in a typical blast of sewing impetuosity, pattern download was bought and fabric sourced. All from the comfort of the sunny shores of Devon. A week of sunshine, sand and ice-cream was just what I needed and I returned to the dappled sunshine of West Oxfordshire desperate to get sewing. It’s essentially a sophisticated gathered skirt, elasticated to suit at the back, with straight side panels. 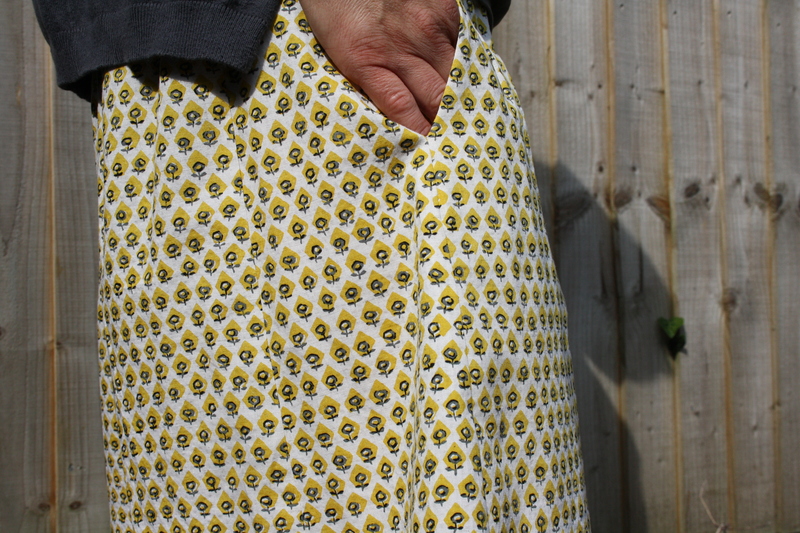 It’s the smooth side panels that make this such a flattering fit, together with pockets that are sewn into the waistband (not shut as I have been known to do before…) The skirt is designed to sit slightly below the waist but I may well position it on my waist next time, not quite sure. Tidy on the inside – it’s a miracle! The fabric was a lovely cotton seersucker from Miss Matatabi, one of my favourite Etsy shops. Not only does she have a wonderful range of fabric but her shipping costs are reasonable and FAST. I mean I’ve known letters take longer from my ma and pa in Sunderland, but that’s another story, and seemingly often another country for Royal Mail. Look at the fabric! Of course this print is perfect for my feisty, no nonsense Northern alter ego (or do I mean my personality?) and I so love the little women’s signs that I flounce in the face of the men of the house. What for, I’m not entirely sure. They’re quite an emancipated bunch. A statement skirt – who’d have thought it?! This pattern really was a dream. The instructions are simple, clear and well thought through. I understood everything. I made no mistakes! I felt competent! In fact, I felt more than competent. I felt good. The insides look as good as the outsides. 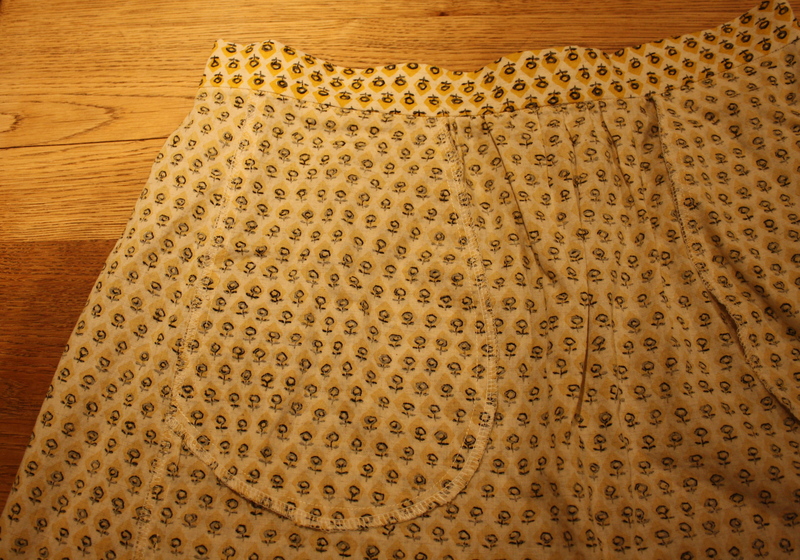 I can tick off pockets as a feat accomplished and as Katie says, the method of sewing the waistband to the skirt is fab-u-lous. Yes, it’s a beginner pattern but it really is so well put together in every sense, I reckon even the dog could sew it. The only slight fly in the ointment (and I’m sure that I’m to blame here) is that the print is slightly skewiff (one of my ma’s favourite phrases – fringes, tiling, shelving, teeth, you name it, it’s a bit wonky). I spent a long time matching selvedges, pulling, tugging, trying to align the grain and this is where I ended up, a bit off kilter. But don’t actually care. I still love this skirt. I already have some lightweight denim ready to make an autumn version. Go me! Ah yes, but wait til I blog about my other makes. The great leveller. There is much sewing to be done in the next month. Two dresses (one for moi and one for Lady Moo) for a very special wedding next month. Two Sorbettos owed as gifts. And the fabric stockpiled for all the summer dresses I was supposed to make but lost time somewhere out there to pestilence, illness, despair and toil. So let’s close the show in my favoured way, with a rather wonderful song. The show has now left town. Yep, the Wilderness Festival is over for another year; the deer can trot back from whence they came; the crash barriers (chortle) can disappear from the train station; and the Co-op is decimated (the 6ft Wilderness banner opposite the shop failed to give them any pointers in terms of stock control…) As this was my first year of non-attendence, I thought I’d offer up a lighter-in-the-air/swaying song to recreate the mood. Lights, camera, joss stick, action.